At an experimental field site in Oconee County, Georgia, technician Steven Knapp cuts a test plot to determine hay yield. Decades of plowing throughout the Piedmont region of the United States have degraded the soil, allowing much of it to be washed away and robbing what is left of nutrients and organic matter. Sorghum, cotton, soybean, and wheat are still widely grown in the region, which stretches all the way from Alabama to New Jersey. But because the soil is so degraded, growers have allowed much of the land to revert to forests and pastures. “Growers need guidance on whether keeping the land unused is the best way to restore degraded soils or whether allowing cattle to graze on it is a viable option,” says Alan Franzluebbers, an Agricultural Research Service ecologist at the J. Phil Campbell, Sr., Natural Resource Conservation Center in Watkinsville, Georgia. The center was started in 1937 to look for ways of improving soil quality for farmers in the southeastern United States. 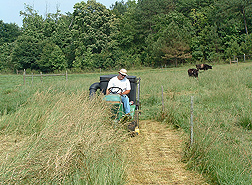 Franzluebbers led a project where researchers planted grasses on 37 acres of rolling, eroded land in northeastern Georgia and allowed beef cattle to graze there to assess the effects on soil quality. Coastal bermudagrass was planted initially, and after 5 years, tall fescue was drilled into it, when the bermudagrass was in a dormant winter stage, to extend the grazing season from 5 months to 10 months of the year. The research team, which included retired ARS scientists John Stuedemann and Stan Wilkinson, varied the number of cattle per acre, and over 12 years they assessed how the soils would respond to four different scenarios: moderate grazing (average of 23 steers for every 10 acres), intensive or heavy grazing (35 steers per 10 acres), no grazing and letting the grass grow, and no grazing but cutting the grass for hay. Under each scenario they looked at the amount of soil compaction that occurred, the amounts of soil organic carbon and nitrogen found in the soils, and the amounts of surface plant residues, which help prevent erosion. Soil compaction makes it harder to grow crops. They also looked at the effects on the soil of three different fertilizer treatments (inorganic fertilizer alone, organic broiler litter alone, and a mix of inorganic fertilizer and organic broiler litter). The team found that fertilizer type made little difference, but different grazing scenarios produced dramatically different effects.Land that was grazed produced more grass than ungrazed land, and grazing led to the most carbon and nitrogen being sequestered in soil. Sequestering carbon and nitrogen in the soil has become a major goal for agriculture because it reduces greenhouse gas emissions. Whether grass was grazed moderately or intensely made little difference on sequestration rates. Cutting grass for hay reduced the amount of surface residue and increased soil compaction but didn’t change the amounts of organic carbon and nitrogen in the soil. Land left unused had the highest surface residue and least soil compaction and was better at sequestering carbon in the soil than haying. From an environmental standpoint, grazing has traditionally been viewed as less desirable than leaving the land unused. But the results, published in the Soil Science Society of America Journal, demonstrate that if growers manage cattle so that pastures are grazed moderately, they’re restoring soil quality and cutting greenhouse gases by keeping carbon in the soil as organic matter rather than releasing it into the atmosphere as carbon dioxide.—By Dennis O'Brien, Agricultural Research Service Information Staff. This research is part of Climate Change, Soils, and Emissions, an ARS national program (#212) described at www.nps.ars.usda.gov. Alan Franzluebbers is with the J. Phil Campbell, Sr., Natural Resource Conservation Center, 1420 Experiment Station Rd., Watkinsville, GA 30677; (706) 769-5631 ext. 223. "Cattle Pastures May Improve Soil Quality" was published in the March 2011 issue of Agricultural Research magazine.